Having your auto glass damaged can cause many problems. It’s not just the damage to the car you have to worry about, but also the money being spent. You want to have a job well done. You also do not want someone ripping you off in the shop either. Waiting hours and hours for a repair job can be quite stressful. We have all been in the situation where you wait endlessly to hear the verdict of your vehicle and bill. This is why you need to direct all your worries and concerns for your car to Empire Auto Glass. We do not believe in bleeding our clients dry of money. We also do not believe in making our clients wait a long time. This is why at Empire Auto Glass, we do our absolute best to serve you as quickly and conveniently as possible. 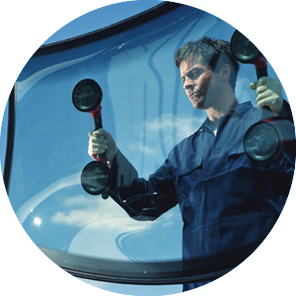 What are the Benefits of Coming to Empire Auto Glass? You will not have to wait around with us. As soon as you come in, we will pull your car in. Your schedule will not have to be changed for our sake or for your sake. We will make it worth your time. At Empire Auto Glass, we only do the job that’s required to get done. You can trust us! If you go back to work or home, we will call you when your car is done. It’s that simple! We are even open on the weekends. We will come out to you on a Sunday, if that is also what you need. Your plans can still go as planned. We will also educate you on all of our technicians. You will not get this from most repair/replacement shops. We will tell you what needs to be done as well as how much it will cost. We only charge you for what is necessary to get done. If there is something special that requires maintenance, we will sit down with you prior. This way, you won’t be so surprised. Please call our shop today at 703-573-7700 or 301-830-6262. Come in and talk with our technicians before your car gets worked on. This way you know who is going to be doing the work. Ask us about our experience and skill levels. At Empire Auto Glass, it’s all about our customers!